Battery life is one of the most important aspects of a smartphone, as it effectively determines how long you'll be able to use all of its other features. 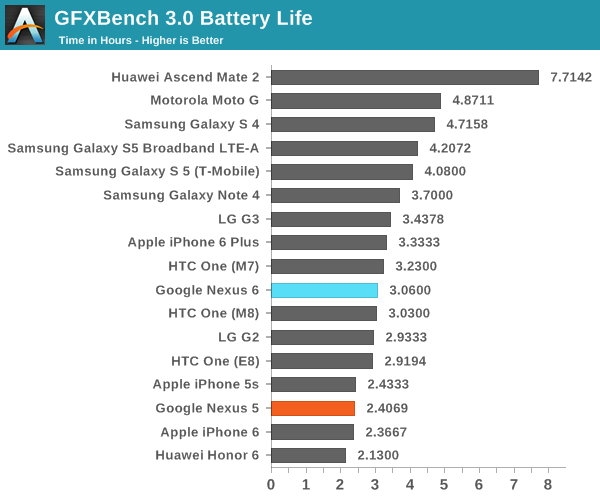 In order to get a comprehensive understanding of battery life on the Nexus 6 we run a variety of tests that attempt to stress different parts of the device in order to determine the battery performance in different conditions. Most important is that all displays are calibrated to 200 nits to avoid penalizing certain phones for having brighter displays than others. The first test is our WiFi web browsing test which loads a set of web pages in a loop with pauses to avoid penalizing phones with faster SoCs than others. 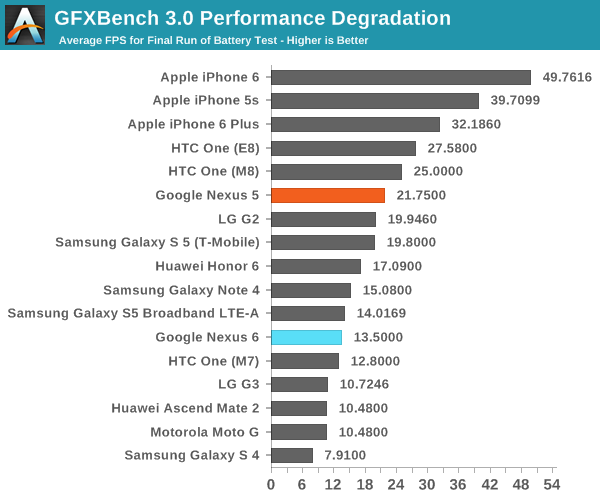 In this test we see that the Nexus 6 does perform somewhat poorly. Compared to Samsung's Galaxy Note 4 which has essentially the same specifications on paper, the Nexus 6 lasts 4.27 hours shorter. It is likely that this can be attributed to the display, which may not be as efficient as the latest and greatest AMOLED panel used in the Note 4. 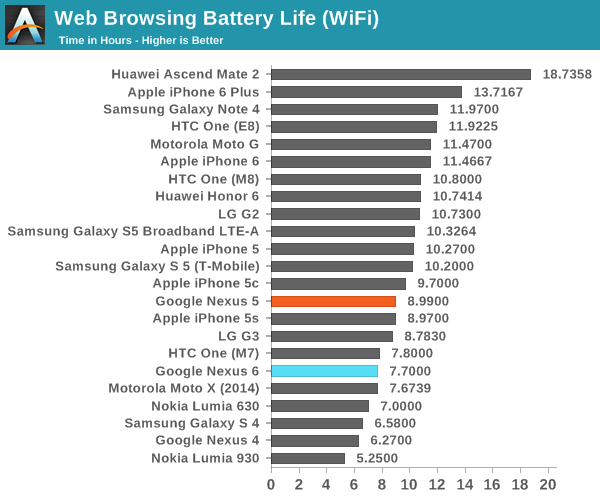 At this point we would usually post results for web browsing battery life on LTE. However, I've had difficulty locating a place to perform testing with a reliable cellular signal, and I didn't wish to put the Nexus 6 at an unfair disadvantage by performing the test with poor reception. Because of this, I was unable to obtain LTE battery life results for the Nexus 6, but given the platform it's likely that battery life is around 7.25 to 7.5 hours on our LTE web test. 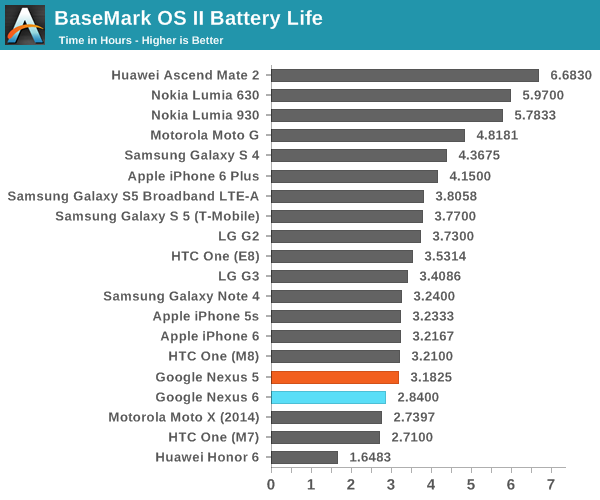 In our more SoC-bound BaseMark OS II battery test we see that the Nexus 6 doesn't last quite as long as the Note 4. This is again likely due to a higher display power consumption on the Nexus 6, as both devices share the same SoC fabricated on the same process. However, we see that the battery score is a bit higher, likely due to a higher average CPU frequency afforded by a larger heat dissipation area to reduce throttling. 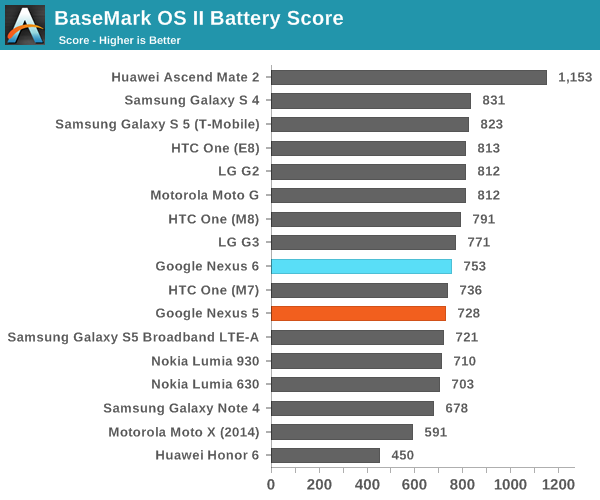 With GFXBench which is a more GPU focused test, we see similar results to our BaseMark OS II test. The Nexus 6 doesn't last quite as long as the Galaxy Note 4, with slightly more than 3 hours of usage compared to the Note 4 with 3.7 hours of usage. The gap definitely closes between the two here, but unfortunately it seems that the display continues to hurt overall battery life. The fact that the web browsing result is so close here suggests that Motorola is continuing to target "24 hours of mixed usage", so if one does fit their usage model they shouldn't have isssues lasting a day on battery. I can't help but think that a good LCD would get them much more battery life for the same battery size, but it should be usable here even if it's behind the competition. 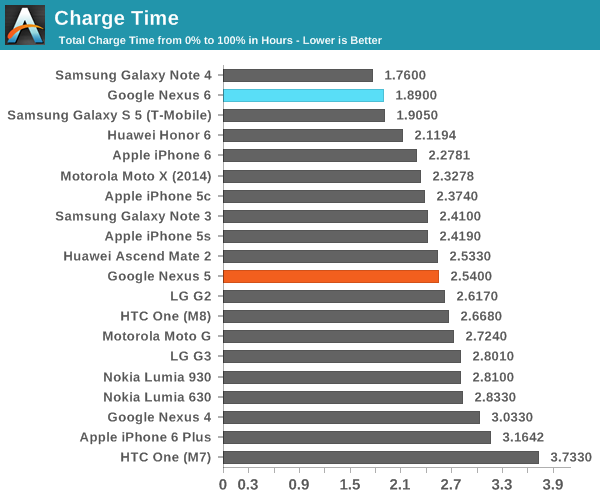 The charge time of a smartphone is also very important. While having a long battery life means that a device can be used for longer, if it also requires a very long charging time it may be that the device is less frequently able to be fully charged and thus unable to actually reach its potential battery life. Charge time can also be an important factor in time-constrained situations such as topping up your battery before a flight. In order to test battery life we deplete the device's battery charge to 0, and then measure the duration that the device is plugged in until it reaches a power draw that indicates it is completely charged. The Nexus 6 includes Motorola's Turbo Charger which can output 9V at 1.6A or 12V at 1.2A to Qualcomm Quick Charge 2.0 compatible devices. As you can see above, this leads to an exceptionally low charge time of 1.89 hours. I'm very glad that Google and Motorola decided to include the Turbo Charger instead of a typical 5W adapter. Something I would like to note is that my Turbo Charger did exhibit very noticeable coil whine, although this may have simply been an issue specific to my unit.